The Juneau-Douglas High School hockey team’s hopes of winning a state title were dashed on Friday night. Homer goaltender Hunter Warren had a lot to do with it. Warren — the same masked man the Crimson Bears scored seven goals on three weeks earlier in Juneau — made 43 stops as Homer defeated JDHS 3-0 in the Division II state semifinals game at the Curtis Menard Sports Complex in Wasilla. “This one’s going to sting,” Adams said. Homer junior Ethan Pitzman scored the game-winner on the power play 5:17 into the third period. Pitzman collected the puck off the boards and snapped it past the mitt of JDHS goaltender Cody Mitchell (23 saves) for the 1-0 advantage. Pitzman reeled off two more goals over the ensuing nine minutes for the Mariners, played in the state championship game against Palmer at 5 p.m. Saturday. JDHS played in the third-place game against Soldotna, who lost its semifinal in overtime, at 2:30 p.m. Saturday. 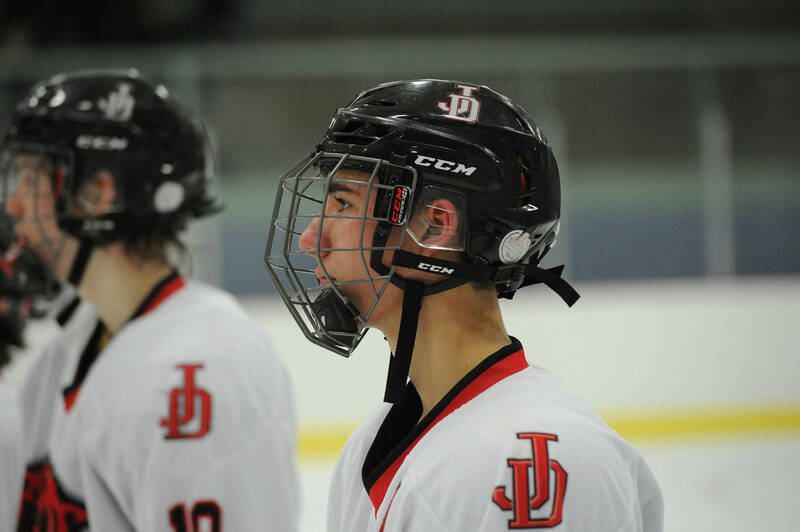 After a back-and-forth first period, JDHS took control in the second. The Crimson Bears had the puck in the Mariners’ end for much of the period while firing 21 shots on goal. Sophomore Chance Turinsky had perhaps the best scoring opportunity of the frame — a one-timer from about 20 feet from the net. But Warren made an improbable glove save, causing Turinsky to crane his head back in disbelief. “It’s a bit heartbreaking to know that we got so close, but that’s the game, and that’s part of the reason we love it,” Adams said. Homer kept the puck mostly clear of Warren after going up 1-0 before adding to its lead. Junior Tyler Gilliland poked the puck of out his zone and went down the ice on a 2-on-1 rush. Gilliland’s intended pass for Pitzman was intercepted by the sliding body of Juneau’s Dalton Hoy, but Pitzman retrieved the puck anyway before shooting it in the net. In other tournament action, North Pole defeated Delta 8-4 and Glennallen held off Tri Valley 1-0. North Pole and Glennallen play ed one another in the fourth-place game at noon Saturday.